Today, in walking distance of my home, I rescued from the curb some lumber, a small storage unit and a furniture mover with wheels bound for the landfill. I used a recent project, built with all recycled components, to transport. And before I traveled the short distance home, I had already thought of 2 kid projects to use some of the materials. A raised bed garden for my 3 year old granddaughter. She will help make it, plant seeds and keep it watered and weeded. Refurbish the small storage unit. This will involve some sanding, painting and potential decals/stickers. I may let one or both (her 2 year old brother) do a little painting. I have been explaining things to my granddaughter. Composting (feeding the worms), growing food which she eats out of the garden and saving things from being thrown away. She is pretty bright and will absorb some of it. She will also be doing it with grandpa. It’s all about spending time with them. Recycled thoughts, Contacted Harris Teeter corp, Confirm their policy on recycling plastic bags, Dispel rumors? 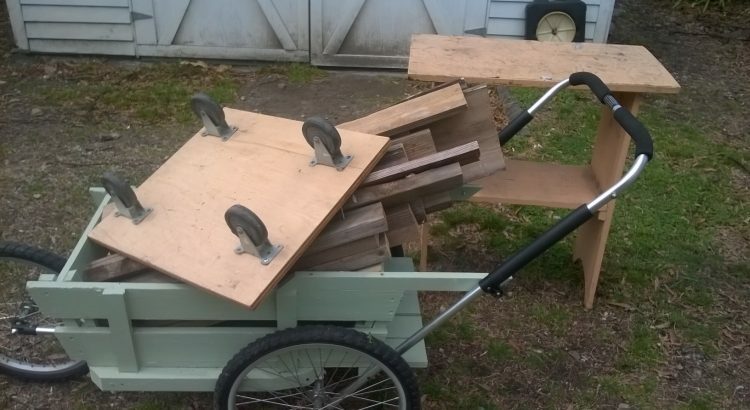 Wow, I’d sure like to know more about your garden cart you hauled everything home I .